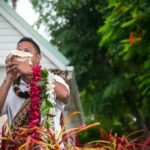 A morning wedding at the Mauna Lani Hotel on the Big Island of Hawaii. 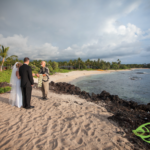 Morning weddings have the advantage of bluer skies and water as compared to a sunset wedding. This wedding was no exception with such a beautiful background. It was just the couple on the beach under a tree. After the wedding the couple walked around the resort taking photos at various scenic locations.